New York City is packed with Italian restaurants, though thanks to distance and time away from the motherland, the food they serve is distinctly Italian-American, having evolved from its origins into an entirely new cuisine altogether. 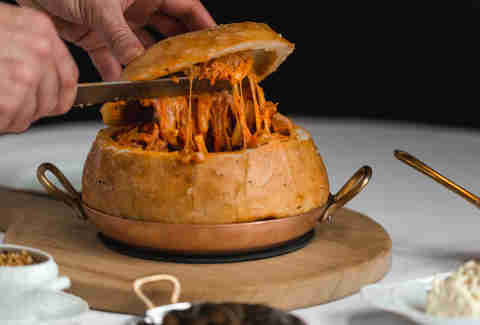 I love a dinner plate-sized chicken Parm or a tray of steaming clams oreganata as much as the next Jersey-born italo-americana, but to find dishes and restaurants that most closely mirror the spirit of food in Italy, you'll have to look beyond the city's famed "red sauce" joints, like Park Side in Queens or Bamonte's in Brooklyn, to an entirely different type of dining. These restaurants, many of which are helmed by women with extensive experience in Italy, look across the Atlantic for inspiration to deliver seasonal, ingredient-driven, conservatively portioned (and ideally digestible; in Italy, this is a prerequisite for a successful meal) dishes to the city's tables. After years in fine dining -- including five spent at Chicago's Spiaggia, followed by a tenure at Manhattan's Michelin-starred A Voce and A Voce Columbus -- James Beard Award-nominated chef Missy Robbins has struck out on her own with Lilia, an airy and bright restaurant in Williamsburg. Featuring handmade pastas and wood-fired meat and seafood, Robbins' menu surveys Italy from north to south, drawing on the potent flavors of the France-adjacent Piedmont region with garlic- and anchovy-laced bagna cauda (a rich warm dip), while conveying Calabria's coastal flavors through swordfish with Tropea onions. In the daytime when the restaurant is closed, you can visit the adjoined Lilia Caffe, which serves coffee, sandwiches, and sweets all day. 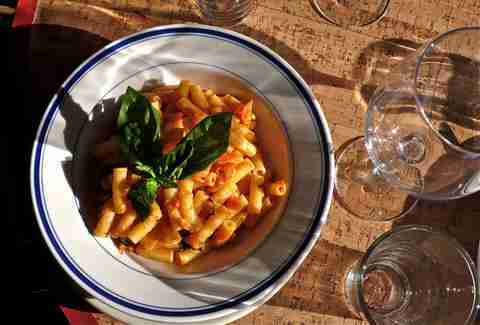 The stenciled phrase "ristorante toscano" that greets visitors at the entrance of Rita Sodi's dinner-only gastroteca in the West Village announces the restaurant's intentions: to serve the food of Tuscany. Sodi grew up on a farm outside of Florence in an area known for its beef, so you can expect things like steak tartare and tagliata con rucola (sliced NY strip with arugula) alongside simple pastas like ravioli with butter and sage and tagliatelle with caramelized onions. Departing slightly from the Tuscan theme, Rome's cacio e pepe also makes an appearance -- one of the few examples in NYC that faithfully replicates the flavor and texture of its Roman incarnation. 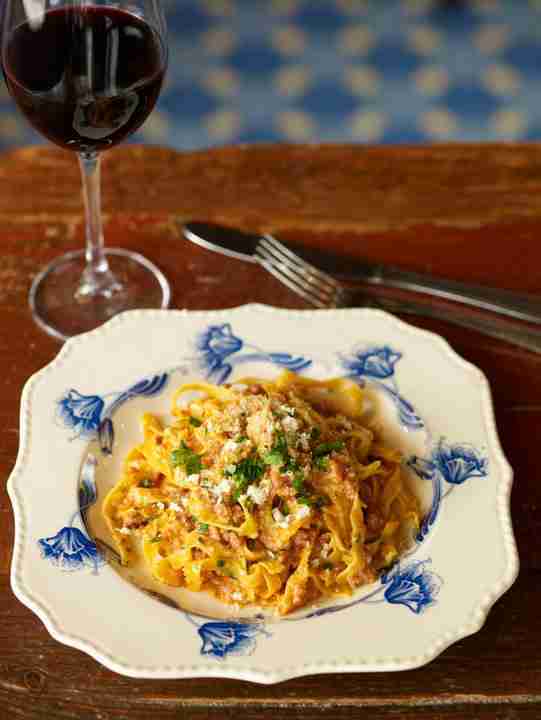 Chef Anna Klinger and Emiliano Coppa bring a little bit of the Veneto, a region in Northeastern Italy, to Brooklyn at this Park Slope institution. For nearly two decades, the kitchen has evoked the earthy homestyle cuisine of the Veneto with dishes like braised rabbit, Venetian-style calf's liver (with creamy and grilled polenta, respectively), and casunziei, a classic crescent-shaped pasta filled with beet and ricotta. The occasional South-Central Italian speciality like Rome's saltimbocca (layered veal and prosciutto) might find its way onto the menu, too. Al di la seats mainly walk-ins, but it's still incredibly popular, so you can expect a considerable wait at peak hours. While many American cooks stoked their affinity to Italy through short-term stages abroad or in-depth study from afar, chef Sara Jenkins grew up between Rome, Tuscany, and Umbria -- among other places. Her unpretentious cooking, which draws heavily on the seasonal ingredients and centuries-long traditions of Central Italy, is restrained and lets the few well-chosen ingredients mingle to great effect. 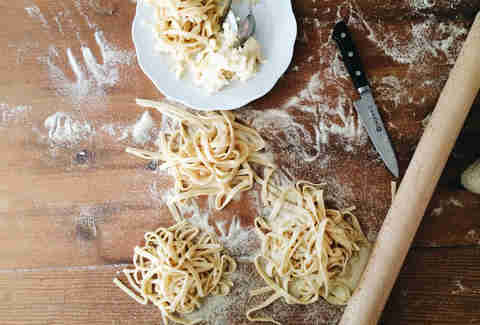 Starters like toasted bread seasoned with olive oil from her family's farm and pastas like fettuccine with brown butter and mushrooms are complete and unfussy expressions of Central Italy's simple and straightforward flavors. When Del Posto opened in 2005, it was the Batali & Bastianich Hospitality Group's most ambitious project to date (since then, its partnership in the Italian brand Eataly has eclipsed even its finest restaurant). The gilded 24,000sqft restaurant, which manages to feel incredibly inviting in spite of its colossal dimensions, describes itself as Italy's 21st region. For more than a decade, chef Mark Ladner and his kitchen crew have diligently adapted the artisanal pastas, impeccable ingredients, and historical recipes of Italy for their elite New York audience. The signature 100-layer lasagne draws inspiration from the ethereal lasagne of Bologna, adding many additional layers for delicious dramatic effect, while Livorno-style cacciucco riffs on a regional fish stew from the Tuscan coast. 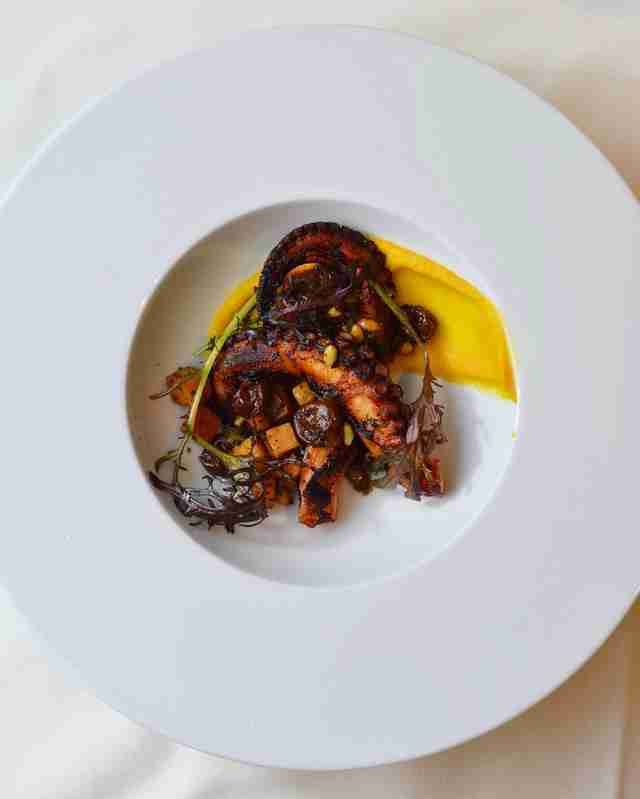 Ladner recently departed the restaurant and handed the reins to chef Melissa Rodriguez. Opened in 2009 by Italy natives, this pizzeria-trattoria in Bed-Stuy serves thick-rimmed, Neapolitan-style pizza and seasonal specials in a set of rooms assembled from a former garage and storefront. The menu features around a dozen pies including austere classics like the Marinara (tomatoes, anchovies, olives, and garlic) and at least as many starters, such as braised beef meatballs and burrata with bottarga. There are a handful of (mostly meaty) pastas and mains, while in classic Italian fashion the vegetable sides are tucked away at the bottom of the menu -- but shouldn't be overlooked. Saraghina Bakery next door (433 Halsey St) does sandwiches and sweet and savory snacks, while a third location, Saraghina Bar (348 Lewis Ave), serves light fare and drinks. 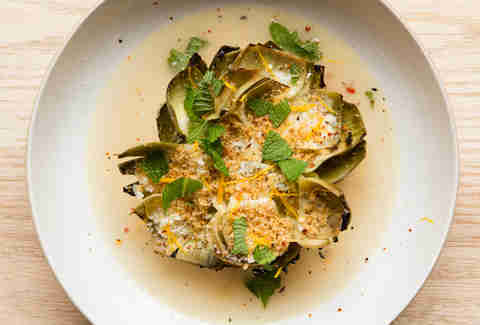 From Rita Sodi of I Sodi and Italo-Francophile Jody Williams of nearby Buvette, Via Carota serves an Italy-inspired, vegetable-rich menu from 11am until midnight in a pair of wood-accented rooms in the West Village. The all-day service and abundance of small plates give Via Carota more of a wine bar feel than that of a traditional sit-down restaurant, and the homey atmosphere and decor channels the 17th-century farmhouse of Sodi's youth. Visitors can drop in for a small bite at the bar or in the dining rooms, or opt for a full meal, choosing snacks like spicy anchovy bruschetta, stewed tripe, and blood orange salad, followed by pasta and a main. The wine list also provides an excellent survey of Italian vino with an emphasis on native grapes. While not a restaurant, the small retail area at Jim Lahey's Sullivan Street Bakery in Hell's Kitchen sells sweets, flatbreads, and savory snacks that would be at home in any Roman panificio. Lahey's breads and sweets are influenced by the time he spent working in Rome at Forno Campo de' Fiori and at bakeries in nearby Lariano, a village famed for its wood-fired sourdough. In addition to transporting his skills back to NYC, Lahey has become an ambassador of sorts for how Central Italians eat bread and pizza, allowing light, digestible ingredients to enhance the final product -- an approach embodied in simple items such as pizza bianca (a flatbread seasoned with olive oil and salt) and pizza rossa (a flatbread topped with tomato sauce), both sliced from long slabs and served in rectangular pieces. 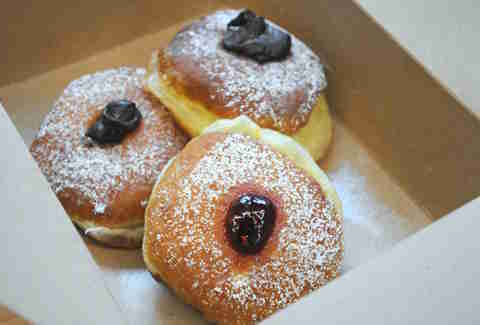 On the sweet side, the bomboloni (filled donuts) are a classic Central Italian breakfast and Lahey's version rivals any in Italy. The bakery has a second, larger retail location in Chelsea (236 9th Ave), a few doors down from sister restaurant Co. (230 9th Ave), an exceptional pizzeria serving wood-fired pies. 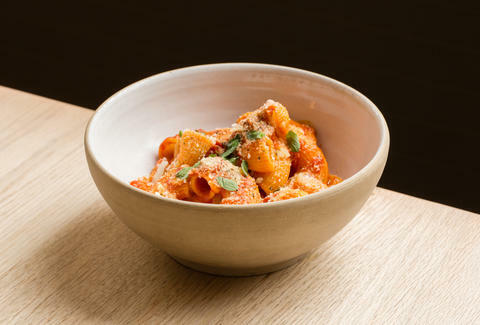 Danny Meyer's Maialino, a Rome-inspired restaurant helmed by chef Nick Anderer, pays homage to the Italian capital with all the city's classics that you might expect: cacio e pepe, carbonara, amatriciana, and roasted lamb. 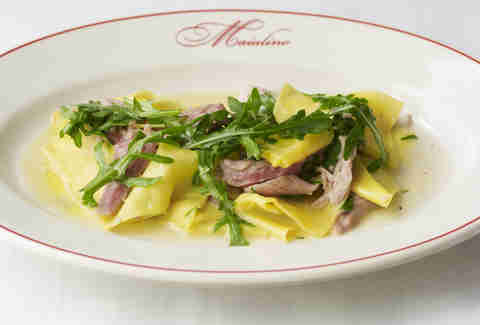 As the name suggests ("maialino" means suckling pig), there's some pork in the mix, too, ranging from cured meats from the US and Italy to roasted maialino with rosemary potatoes. There are also dishes you won't find in Rome, which instead draw from local farms and are prepared in a Roman spirit, highlighting the freshness and flavor of the season. Maialino also departs from its Roman muse with its vast vintage amaro list, a phenomenon that is totally absent in Rome, but is a welcome feature of an Italo-centric bar program. And speaking of drinks, the bar is open all day, thanks to its location in the Gramercy Park Hotel lobby, and serves wine, cocktails, and spirits, as well as breakfast, lunch, and dinner. Ai Fiori in Midtown marries the atmosphere of the Milan power-lunch venue and the elegant fish-driven menu of a fine-dining restaurant on the Amalfi Coast. It's an odd mix, but it works, and just as Milan and Amalfi's posh restaurants aren't bound by Italy's borders when it comes to luxury, Ai Fiori also ventures away from Italian ingredients when it means elevating a dish like fluke crudo with the addition of sturgeon caviar. Pasta and risotto dishes, meanwhile, might be garnished with a flurry of black or white truffles, season permitting. In addition to a la carte items, Ai Fiori also serves tasting menus (two, three, or five courses at lunch and a four-course prix fixe or a seven-course chef's tasting menu at dinner). While fish is the main attraction, there are also a few meat dishes on the menu, plus a custom dry-aged White Label burger at lunch. Katie Parla is a Rome-based food and beverage writer, educator, and culinary guide. She has written and contributed to more than 20 books about Italy. Her forthcoming cookbook detailing the lost and disappearing dishes of Southern Italy will be published by Clarkson Potter in 2018. Follow her on Twitter and Instagram.